It is only natural that we can come up with some succulent desserts to please any priority! Thaw the frozen sato imo. Put them inside an oven dish, cover with cellophane paper and cook in microwave oven for 5~6 minutes until they get soft. 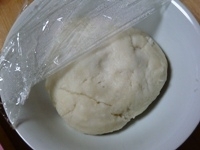 Add one third of rice powder to mashed sato imo and mix well, kneading all the time. Cover with cellophane paper and cook inside microwave oven for 2 minutes and a half. Repeat process twice more. Make sure that all rice powder has been used. Add sugar and mix well. Cover again with cellophane paper and cook inside microwave oven for 3 more minutes. Prepare some sweet water with 2 tablespoons of water and 1 tablespoon of sugar. 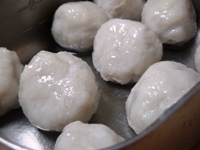 Make balls with mashed sato imo, wetting your palms with the sweet water beforeahnd. 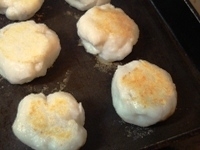 In a frypan with only a little oil fry balls on both sides util they attain a light brown color. Let cool down completely. In a saucepan pour the soy sauce, water and sugar. heat until the sugar has completely dissolved. Add cornstarch dissolevd in lukewarm water and stir until the sauce has become a thick syrup. Take off fire. Add ground black sesame seeds and mix. 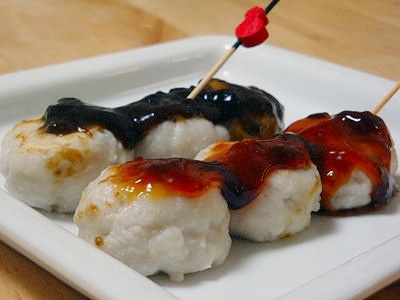 Serve the dango/balls topped wipped with sweet sauce. The basic problem for most vegans (and vegetarians) is to find or create food with a sufficien/satisfying “bite”. Imo or sato imo/taro in this case do provide that satisfactory sensation and can be presented in an appetizing manner for big appetites! One such simple recipe is Imo Burgers! Peel and boil taro until you can pass a stick through easily. 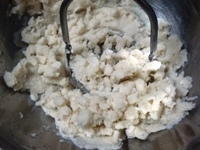 Mash the boiled taro in a food processor. This is how it should look. Don’t worry if somelittle pieces are left. Transfer into a large bowl and add cornstarch, soy sauc, salt and black pepper. Moisten your hands and form burgers in your preferred shape. Fry the burgers (on teflon so you don’t need any oil) until they reach a nice color. Slice some mushrooms (any tender mushrooms are fine). Add another kind of mushroom shred into strips or ribblens. Mix the sweet and sour ingredients into a bowl. 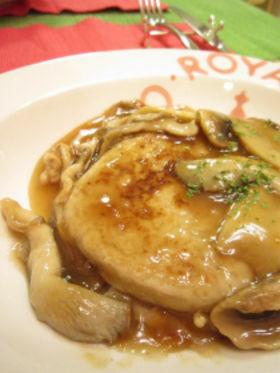 Fry the mushrooms in a little oil until they get soft and add sweet and sour sauce and cook until the mushrooms are nice and soft. Place the burger on a hot serving dish and pour sauce on op. Many people have pressing dietary priorities caused by allergies. For example wheat flour is a big problem when you want to create bread, cakes or crackers. 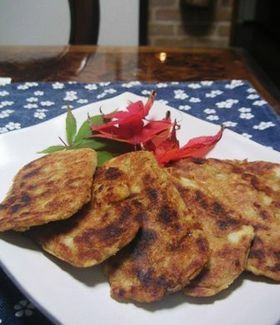 Here is a simple suggestion to make crackers with sato imo/里芋/taro. They should please vegans and vegetarians, too! 1- Mash the boiled sato imo/taro. If too hard, soften them inside a microwave oven first. 2-Pour the mashed sato imo in a large bowl. Add soy sauce, sugar and water mix well. For extra taste you can use green tea or oolong tea instead of plain water. 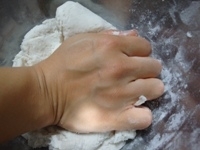 3-Shape the paste into sembei (square, round, oval as you like). Brush sesame oil on both sides and grill them. Try and press them all the time while they grill! They will taste better! Japanese cuisine makes for some very healthy food. 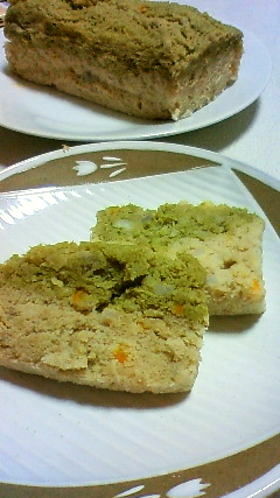 I have already introduce koyadofu, a variety of dried tofu, sato imo or taro. Here is a simple and hearty recipe fir for any age group! -Cut the chickeninto small bite-sized chunks amd marinate with soy sauce and Japanese sake. -Cut the hard part of the shungiku (or other green leaf vegetable such as soinach, and so on), boil lightly in salted water, drain and cut into 5 cm (2 inches) bits. 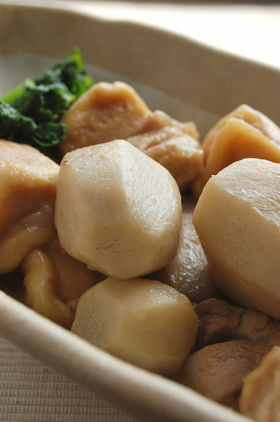 -Peel sato imo/taro as shown on above pic. Boil. Clean in clear water to get rid of the stickiness. Transfer into a zaru/sieve basket. -Soften koyadofu in lukewarm water. Press out all water. Cut into 1.5 cm (0.7 inch) squares and coat with flour. Deep-fry in oil at 160 degrees Celsius. Scoop out as soon as they change color. Tansfer into a sieve basket and pour hot water on it to take out excess oil. 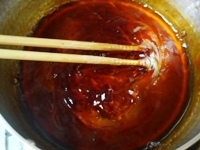 -In a pan, drop the dashi, soy sauce, sake and sugar. Bring slowly to boil and reduce fire to low. Add sato imo/taro and koyadofu. Simmer for a while on a low fire to allow all sato imo and koyadofu to absorb taste. -In another pan bring some water to boil. Wipe chicken off any humidity. Coat with flour. Drop into boiling water and cook until tender. -Once cooked, transfer into sieve basket/zaru. -Once the sato imo and koyadofu are cooked to satisfaction, add chicken. Simmer for 2=3 minutes. -Serve into dish with greens. As demonstrated by many food bloggers, cooking and creating great foods and drinks have become incomplete and unsatisfying when not considering the benefits or adverse effects of the same foods and drinks regardless of their taste. I do not intend to delve into counselling or consulting, but only to offer some knowledge about the good sides of Japanese foods and drinks. I will not extoll on its possible lacks and negative aspects. After all, the Japanese are not the longest-living people in the world for no reason! I will also offr at least one nutritious or healthy recipe at the end of each posting. 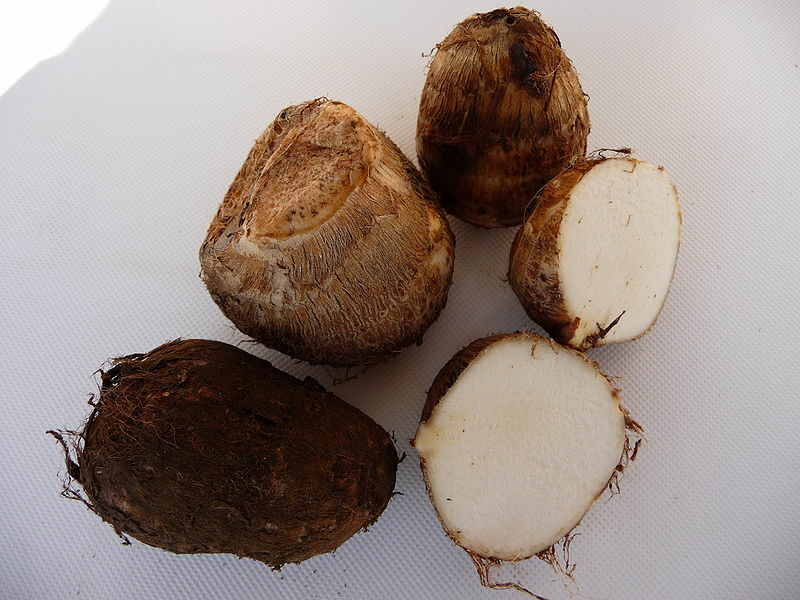 Sato Imo, or Taro, orignally come from Malaysia and its Latin name is Colocasia esculenta. Apart of water, they mainly contain starches, making a stamina food. Onced cooked, the same starches are very easy to digest by the human body. It is also a “health food” because of its high potassium contents (to combat high blood pressure and stress in particular). Their high contents in vegetal fibers also make it a very important vegetable. -Combined with eggs, or with chicken, or with sardine, or with bonito, increases stamina and promotes general health. -Combined with tofu, or with milk, helps promote general health and brain activity. -Combined with enokitake mushrooms, or with devil’s tongue tuber/konnyaku, or with burdock root/gobo, helps lower down blood cholesterol, helps prevent high blood pressure and cancer. -Combined with konbu/seaweed, or with miso paste, or with onion, or with green chili pepper, promotes general health and blood circulation. Wash the sato imo/taro well in clear cold running water. Cut off both extremities. Place in an oven dish. Cover with cellophane paper. Heat in microwave oven for 6 minutes. Check if they are cooked by stabbing them with a sharp and thin wooden stick. In a small pan, drop miso, mirin, sugar and sake. Mix well. Heat over a small fire and stir at th same time until the sauce has become smooth. Peel the taro while hot. Place on a dish and pour sauce on top! Benn rummaging through my notes and discovered another simple and hearty recipe for my vegan and vegetarian friends! 1-Peel taro and cut into big pieces. Cut carrot into large pieces. Cut onion into 4 quarters. Cut the garlic into thin slices. Cut the cabbage into rough pieces. 2-In a pan drop the taro, carrot, onion and garlic with the tomato and switch on fire. Bring to boil and then lower fire. Cover with lid and cook until vegetables are soft. 3-If you have a pressure cooker, pour everything into it, heat and cook on a low fire for 5 minutes. 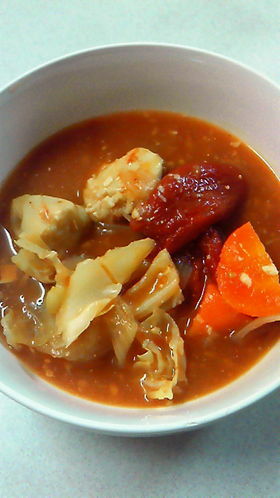 4-Add cabbage, miso, mirin and water and cook for a while until cabbage has become soft. Rectify/season with a little salt if necessary although miso contains enough salt. -Any miso can be used according to your preferences. -I personally add some lemon juice. -When servin in bowls, I top it with chopped thin leeks. Fresh coriander would be great, too.